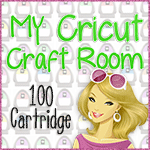 Collectively the design team uses over 100 different Cricut Cartridges in their projects during the two days of this hop. Today I am sharing this apple layout I made. I used Home Accents, Give a hoot, & Plantin schoolbook cartridges to make this. All papers are from DCWV. 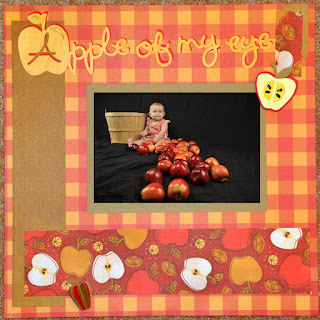 The title is made with my gypsy and I used the apple from give a hoot and the font from Holiday cakes. I welded the letters together and to the apple. I left the A inside the apple without welding it. To make this apple i cut it multiple times and then folded the apple in half and adhered each one to the other. It's cut in red and kraft. On this apple I used scribbles 3d paint to make the black pop. It's also on pop dots. And heres the whole line up for both days! This is a super cute layout!! 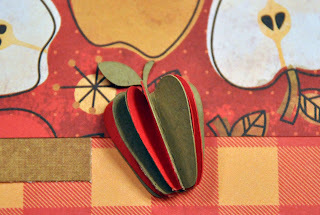 I love the detail with your 3D apple... great idea!!! love this font...need to play with it more. Such an adorable layout. Love all the details! TFS!! Wonderful job! Love the layout, it shows off your picture beautifully. Adorable page!! LOVE your apples! Wonderful page! Love the apple theme and the different apple cuts. Love your apple pages, they're awesome!! Beautiful lo!! Love the apples!! 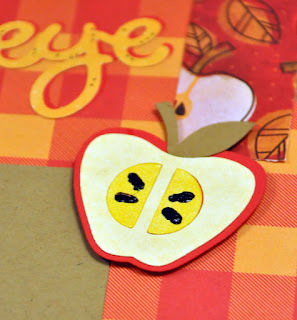 Love your layout...makes me want to take the kids apple picking. Great Layout. Love all the apples! Ohh my....a darling layout and your little one is too cute! LOve the photo! I love the Title!! Its amazing. Great job. Love all those apples. Fabulous job on the 3D apple, too. Very cute page Love the apples! Aaaaw, what a cute layout and I love that apple you created, such a great idea.. Stunning picture. I like the cute 3d apple. So so cute, the layout is adorable!! Love love your layout !!! LOVE your LO Jamie! The picture is beautiful! This is adorable I love how your apple opens.